I was curious to start reading I Will Never Forget. It’s a book of so much help to those in charge of someone close to them who is struggling with dementia. What I loved about this book from the very beginning was the shifting back and forth between the past and the present. The author uses this technique to best present her mother. The little stories and moments presented are so vivid and create a clear image of the woman her mother was in her youth, establishing the contrast for the woman her mother became in her last years. Probably these were my favourite parts, seeing glimpses of both the author and her mother’s past. Giving the specific years was also helpful as it helps the reader pin point the exact moments of the stories. The author is transparent in her telling of the story. Maybe “story” is not the best word as it makes one think of things not really true, and this writing bubbles with authenticity. The book is written having her mother at the center of the narration. The portrait she created for her mother is gorgeous. I for one could see the gap between the Betty of the past and the Betty of the later days. Clearly the author had a great relationship with her mother (as she has with her daughters), and after the loss of her father and her older brother, she was the only one in her family who could care for her mother. I can’t speak from experience, but I image how hard it must be to deal with all the administrative aspects of caring for someone, in the same time making sure the person you care for is comfortable, feels loved, and you appear brave and put together. 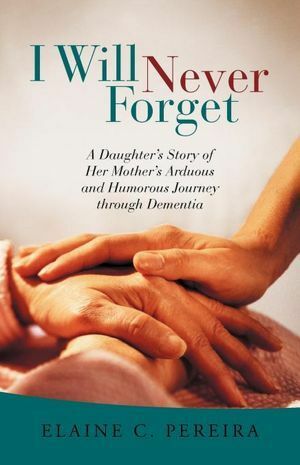 I admire her (and I think this gives authenticity to the book) willingness to accept her faults and I felt for her when she expressed her regret in not paying more attention to the early signs of dementia. That’s just a daughter’s desire to keep her mother’s old self for as long as possible. But once things were set in motion, Elaine (the author), was nothing short of game on! Her dedication, her juggling of all things that needed to be taken care of, adding to her mother’s illness the responsibilities of everyday life, her relationship with her husband (who was supportive at all times. I love their relationship! ), her desire to be there for and involved in her daughters and grandchildren’s lives, all these are a lot! I, as a detached reader in the beginning, was nothing short of impressed and respectful of her ability to carry all things to completion. This is such a helpful read for those who are caring for someone affected by dementia. While it’s not a practical “how to” book, it gives insight into someone else’s history and dealing with the disease. It sure makes one feel less alone. At one point I got the feeling that the whole book is just a writing therapy, writing to get things in order, to see them written down and possibly to make sense of them all. The writing is lovely and I also enjoyed the chapter titles, every time I started a new one I couldn’t help but smile. I recommend this book. Sign into Goodreads to see if any of your friends have read I Will Never Forget.